Red-hot favourite Harry Angel burst out of the stalls without a problem this time after his mishap at Royal Ascot, but may have used up too much gas too soon, as despite having a break on all the field bar outsider Hey Jonesy, he was treading water inside the final furlong. The challengers were coming from behind and for a horse who is usually held up, The Tin Man hit the front with more than a furlong to go under Oisin Murphy, who replaced Tom Queally in the saddle. Brando and Gustav Klimt, who was last at halfway on his return to six furlongs, were closing in the final strides, but James Fanshawe’s 7-1 chance hung on to win by half a length, having been second two years ago and third last year. 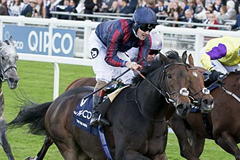 Newmarket trainer Fanshawe said: “He’s a wonderful horse and is so consistent. You could argue he’d been unlucky a couple of times this year. “Everyone is biased towards their own horses, but I felt he’d run two really good races at Ascot and Deauville. “I was concerned about the (heavy) ground, but the rest of the family love it. It’s easy to say after the event. He added: “It’s amazing because the vets in Hong Kong did a fantastic job. He nearly died in Hong Kong. He had a temperature and we couldn’t run him. We got him back and the vets have done a great job getting him back again. “We couldn’t do it without our staff as well. They’ve done a wonderful job to get the horse to run in this race. Murphy has also won the Coral-Eclipse, Sussex Stakes and Juddmonte International this season, in what has been a breakthrough campaign. He said: “I’m so lucky to have found so many good horses in such short space of time. This was great. He’s a horse I’d looked forward to riding all week. “The race didn’t really go to plan. I didn’t travel great early, but he’s a very good horse and deserved this. Kevin Ryan was delighted to see Brando put a disappointing run in France behind him. He said: “I think he was the forgotten horse of the race. He’d been running really well and then he comes up with one average race and some people ignore him. “He travelled into the race great. They have gone pretty hard up front and he’s done everything right, it’s just on the day. Aidan O’Brien said of the Classic-placed Gustav Klimt: “We were delighted with our horse, a three-year-old on that ground. It was his first run back at six.